ok, so no comic today, but I have some process work for a project I'm working on with the African American Children's Theater. This is the artwork for the flyer. If anyone actually sees this, can you do me a favor and tell me which of the four designs you like the most, or which combo of the different elements? Black outlines, brown outlines... title or no... cropped or full... etc. There will be more information on the flyer, so that is what the empty space is for. Allyson, you rock at life. Just so you know... I am checking out your art work, and you are so talented! 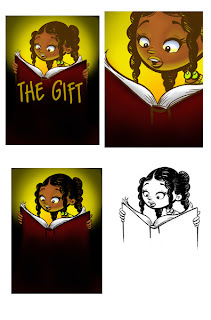 As for "The Gift" images, I like the two top ones, either cropped or with the words--perhaps the two together? Maybe play with the placing of the text?